How One Man Masterminded the Soviet Drive Beat America to the Moon. "In this exceptional book, James Harford pieces together a most compelling and well-written tale. . . . Must reading. "-Space News. "Through masterful research and an engaging narrative style, James Harford gives the world its first in-depth look at the man who should rightly be called the father of the Soviet space program. "-Norman R. Augustine, CEO, Lockheed Martin. "In Korolev, James Harford has written a masterly biography of this enigmatic 'Chief Designer' whose role the Soviets kept secret for fear that Western agents might 'get at' him. "-Daily Telegraph. "Harford's fluency in Russian and his intimate knowledge of space technology give us insights that few, if any, Americans and Russians have had into this dark history of Soviet space."-Dr. Herbert Friedman, Chief Scientist, Hulburt Center for Space Research Naval Research Laboratory. 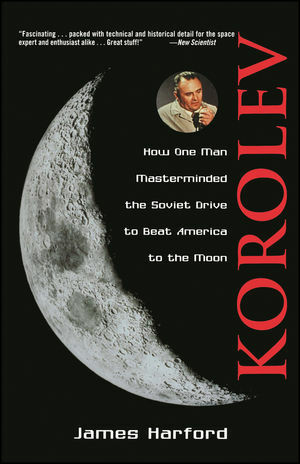 "Reveals the complex, driven personality of a man who, despite unjust imprisonment in the Gulag, toiled tirelessly for the Soviet military industrial complex. . . . More than just a biography, this is also a history of the Soviet space program at the height of the Cold War. . . . Highly recommended. "-Library Journal. "For decades the identity of the Russian Chief Designer who shocked the world with the launching of the first Sputnik was one of the Soviet Union's best-kept secrets. This book tells vividly the story of that man, Sergei Korolev, in remarkable detail, with many facts and anecdotes previously unavailable to the West. "-Sergei Khrushchev, Visiting Senior Fellow, Center for Foreign Policy Development. JAMES HARFORD, Executive Director Emeritus of the American Institute of Aeronautics and Astronautics, Washington, D.C., has been involved in aerospace for over 40 years, and was a Verville Fellow at the National Air and Space Museum. Mr. Harford lives in Princeton, New Jersey. Growing Up in Ukraine: Broken Family, Bolsheviks, Gliders. To Moscow: Tupolev, Tukhachevsky, First Rockets. The Gulag and Sharaga Years. The German V-2: Bedrock Technology. The World's First ICBM: Aimed at the USA. Sputnik: No Big Deal to Khrushchev-At First. Unmanned Firsts: Hitting the Moon and Venus. Gagarin First, Shepard an Anti-climactic Second. Spy Sats and Com Sats. The Organization: Korolev Up and Down. The Technology: Simple but Reliable. Racing Apollo: The Odds Were Enormous. The End of Anonymity: Burial in the Kremlin Wall. After Korolev: Demise of the Circumlunar and Lunar Landing Missions.